Love is in the air this Valentine’s Day, but for one SPRYTE client, matters of the heart are a year-long occupation. Heart House may not be anyone’s destination for a romantic dinner, but the South Jersey cardiology group is striving to be an important part of its patients’ lifestyle year-round. Its 31 doctors at seven locations are authorities in the latest techniques in cardiac care and interventional procedures, so when it comes to healing broken hearts, there’s no one you’d rather talk to. In 2017, Heart House, seeking to build its brand, create loyalty among patients, and inspire referrals, enlisted SPRYTE to for e-marketing support. 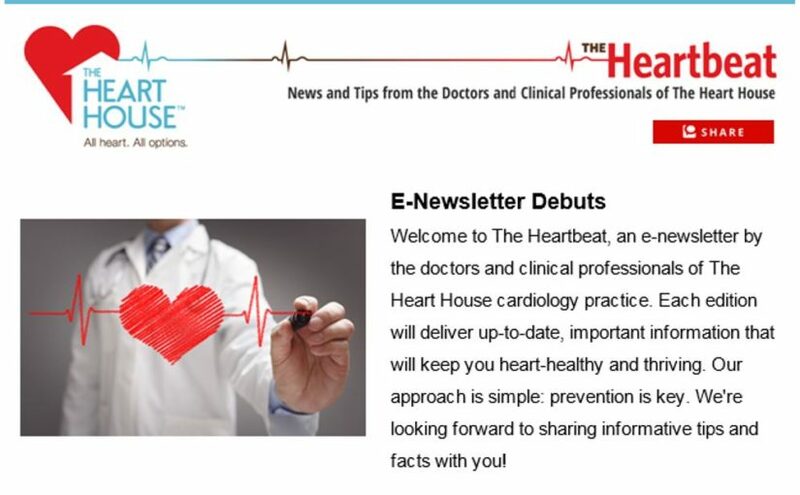 Our centerpiece is a bi-monthly newsletter, The Heartbeat. Gives patients peace of mind that they are well cared for, and Heart House is committed to helping them thrive. To do all this, each edition is divided into three sections: a lead story highlighting news and practice initiatives benefitting patients; a cardiac “factoid” with a compelling, easy-to-digest illustration highlighting current trends and epidemiology; and an “Ask the Doctor” feature, shining a light on a new or innovative device or technique in cardiac treatment. Each piece is short and to the point. For recipients, the first two editions of The Heartbeat were love at first sight. Each enjoyed a 30 percent open rate, nearly twice the 17 percent open rate for physicians, according to a study by Constant Contact. Make it about them, not you. Newsletters full of boastful material about that award your doctor or practice won will get relegated to the delete folder quickly. Include useful information or advice that patients can take to heart and improve their health, lifestyle, or patient experience. Keep it simple. Short blocks of text go a long way with busy readers. Make each item a 1-minute read or less, punctuated by eye-catching graphics. The less scrolling readers have to do, the better. You are striving for a quick, robust brand impression. Put your brand front and center. Include your logo and tag line or value proposition in the banner, and repeat it at the bottom. Be sure to include contact information and office locations. Link to your social media. Every e-marketing platform allows you to include links to your social media feeds, so use them. And make sure your newsletter has highly visible Share buttons, so readers can spread the love. As SPRYTE and Heart House have learned with The Heartbeat, putting tender loving care into your e-marketing effort can pay off by ensuring your patients only have eyes for you.